Cancer – no matter where it shows up in the body – can be terrifying. That’s why Rauchberg Dental Group, your premier dentist in Parsippany, focuses in on this disease during Oral Cancer Awareness Month this April. Since prevention, early detection, and treatment are crucial to keeping your overall health up to par, oral cancer screenings from our team should be a regular part of your exams. Find out more about this disease and what we can do about it in this post. About 40,000 to 50,000 Americans are diagnosed with oral cancer each year, and this disease is more common in men than woman. 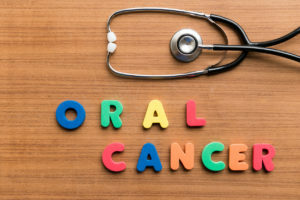 Although there are other cancers that are more routinely diagnosed, and more popularly mentioned in the media, oral cancer awareness is crucial because cancers of the mouth and throat are often deadly – this isn’t because the cancer is difficult to treat, the problem lies in that most people get diagnosed after it’s too late. Tobacco Use – Smoking, chewing, dipping, or using tobacco in any form is the biggest contributor to oral cancer. Cigar and pipe smokers are at the greatest risk for developing this serious disease. Drinking Alcohol – There is a connection between oral cancer and drinking alcohol, especially if you smoke when you drink. HPV Exposure – Coming in contact with the train of the virus called HPV16 greatly increases your risk for developing oral cancer. Many symptoms can be subtle – like a chronic sore throat or hoarseness in your voice. Review the list of oral cancer symptoms here and if you’re exhibiting any of these signs, reach out to use right away. See Your Dentist & Get Screened – Most oral cancers are diagnosed during a dental visit, so be sure to see us regulary. Since early detection is key in helping patients survive oral cancer, get screened at least once a year. The screening only takes a short amount of time, but can save your life. Stop Smoking – Quit using tobacco products in all its forms now. If you need help quitting, talk with our team or your doctor for solutions that will prevent cancers of the mouth, throat, lungs, and other serious medical conditions. Consider Vaccinations – If you’re under the age of 26, talk with your doctor about getting vaccinated for HPV. This preventive measure can help both men and women avoid the damaging effects of HPV16. Eat Healthy – Keeping your immune system strong with a healthy diet is important, so avoid sugar, enjoy leafy greens and dairy products that are loaded with calcium and other vital nutrients, and limit your alcohol intake. Now that you’ve participated in April’s Oral Cancer Awareness month by learning more about this disease, schedule your appointment with Rauchberg Dental Group to get screened today and protect your health!